Good for Leelo, handing his blood draw so well! He's a tough little guy. We had Jaymes on Risperdal from age 3 (I think?) until last month (age 6. Took him off of it because he developed tolerance to it. His Psych is having us do a trial of Abilify. She had told me it was in the same family of drugs as the Risperdal, but a little different, whatever that means. We'll see how Jaymes responds to the new meds. They seem to knock him for a loop. Anyway, I barely comment anymore, but I still enjoy your posts and love to see how well Leelo has been doing! Hey Amber, no worries -- I'm also a good reader but an infrequent commenter. Thanks, yet again, for you input, and I hope all goes well with Jaymes and your kindergarten decisions. I'm another long-time lurker, but had to decloak to mention how much Leelo looks like Mali in the second photo! Thanks for your years of insightful writing - our family's challenges are different, but you're my strong mama role model. I'm delurking to offer that Seroquel led me to gain more than 30 lbs in 4 months, elevated my "bad" cholesterol and also my triglycerides. The weight gain included no dietary changes, though I have been working on LOSING weight for more than a year. As soon as I went on the med, the scale climbed in leaps and bounds. I'd also never had problems with cholesterol before - I'm not much of a meat or dairy eater, and there are no cholesterol problems in our family. So, yeah. Sorry to further muddy the waters. I just freak at the sight of the word Seroquel. Love the pic. Sorry I don't often say much... but I AM looking forward to meeting you at BlogHer! Oh, this is all so familiar. As for anti-anxiety meds - Bud was on Zoloft for several years with good effect, but as he grew, his dose became less effective and an increased dose made him somewhat manic. We switched to Luvox (fluvoxamine), and the fluvoxamine/ risperidone combination has been great. Knocking repeatedly on wood. Incidentally, fluvoxamine is an SSRI that is specifically approved for use to treat OCD in kids. The thoughts on anxiety make sense to me. I can kind of feel his tension as he gets more and more anxious in chaotic situations. on the Abilify. I realizes that the eation was partially an OCD thing. Back on the Luvix and all is well. The sedating effect is a nice benefit. His Abilify dosage is only 3 mg. 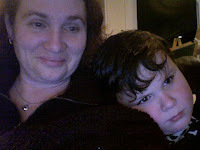 Rode the link to your dec 08 post and got teary remembering how desperate I felt when my son was hitting me everyday. I wish I'd been reading your blog back then too. There is so much about parenting my son that I don't bother to tell anyone because none of them have kids like mine and I sometimes don't have the energy to walk them through my life. I am surrounded by sweet, loving friends who would likely do anything for me, and yet, I confess I sometimes feel more comfort from reading about you and Leelo. Thank you for your honesty and perseverance. I love your blog and I wish you the best in fine tuning the meds or whatever comes next. Hi, also delurking :) Not sure if I have commented before. My 7yo has been on Prozac for nearly 2 years. I do think it has helped quite a lot. It had an initial wow effect which tapered off after a few months. We had to increase the dose twice but he is still on a relatively low dose. He had almost paralyzing anxiety, afraid of everything, obsessing about his fears, needing tons of security items etc. It continues to help him, and he continues to have a lot of anxiety, but it's much more manageable. He had no side effects whatsoever (phew) and it did also help his sleep. I have no personal experience of any other meds. Best of luck! Use melatonin for sleep. No side effects. Use chelation to cure the autism. As for the melatonin, I'm sure you already know that it is not a cure-all for sleep issues. nik gets it every night and still wakes multiple times. Has more to do with the interaction of multiple chemicals in the brain and how they balance or impede one another. @Stephanie, Leelo & Mali have similar body types, too. It's really funny. I am so glad to hear from the rest of you, especially the de-lurkers (hi!) -- this is such important information. I will definitely ask about Luvox. @Foresam, we did try melatonin, it wasn't all that helpful for Leelo -- though I know other people have had good experiences. Keep on drugging him honey. Yeah, that's the answer. Please ignore the pissy troll. It's always the same Comcast-using person from Southern NH/Northern MA, who returns via typing "Leelo and his" into Google. We have gone thru many differant medication cocktails over the years as the boys grew and changed. I think it is very normal, albiet very anxiety provoking for us parents. My boys have been on zoloft andit was great. We switched collegeman to luvox for years and then took him off as he seemed tog et worse, retured to zoloft and oh so much better. There are also mood stabilizers that have helped collegeman. A positive side effect from his anti-seizure meds, but when given to HSB for his ramped up anxiety, even in a minimal dose it was a disaster. WE also tried wellbutrin, remran for the boys at differant times.Horrible, horrible reactions.Yet for some they were miracle drugs. Unfortunately there is no test to see what drug will help or not. Hopefully one day there will be a blood test/genetic test that will let you know which is best, liek with anti-biotics today. Thank you, Elise. So much. I slept VERY well with it, and didn't notice any weight gain from it. So your mileage definitely varies-which is pretty much true with most of these drugs. Hoping for a smooth transition for you folks, if one is necessary. It's almost like medication roulette, isn't it? Sigh. Thank you for sharing your experience. I'm so glad Seroquel worked for you. My son is taking Risperdal, too, on a very low dose for anxiety. It has given him that little edge before he goes off a deep end (which are now fewer and farther between). I know what you mean about tweaking a dose that works. It's scary and frightening, just as much as it did before we decide to medicate our children. We're running into the same roadblock with the Risperdal. My son did not do well on Seroquel. It really blunted his affect, and ho was just "out of it". Just something to watch for. Charlie takes a couple of medications. He's been off of Risperdal since June with good results for his weight (Charlie also started to develop tics while on the Risperdal---it was time for something new, for sure). Taking Charlie off one thing and putting him on another was extremely difficult, I can't sugarcoat it! But you have a great great team and I know it'll go ok---and Leelo is the champ. What a trooper! I am glad it went so well. After much deliberation we finally put our 8 yo son on Zoloft last fall. It has helped him tremendously! His issues have always been SPD with severe anxiety. We didn't realize that he really had OCD as well, not completely understanding how it can manifest for young children. Initially he did have stomach issues and was sleepy, but it evened out after a few weeks on the meds. Taking the medicine has decreased his anxiety and has lessened his obsessive repeating. It has also helped with his throat clearing and finger picking, among other OCD-ish behaviors. Good luck with the medicine roulette, I hope you can find the right solution. I dont have any advice-since we havent hit that place yet-but I just wanted to say hang in there. AspergerNinja, MommyDearest, Kristina, Lori, and Jo -- all the support, in all its forms, is so appreciated. @Kristina, we used the visual schedule to help Leo anticipate what was happening, and the near-chanting ("first needle, then sandwich") during the procedure to let him know it was going to be over soon, and that he had something to look forward to afterwards. But Leo is smaller than Charlie, and seems to be in a relatively compliant phase. I'm hoping it lasts. And I'm hoping Charlie lets you know how to wrangle a blood draw in the near future. Oh boy, I'm glad I found you. Been there, done that, bought the teeshirt with the meds. We've tried so many different treatments for our son and his anxiety (and behaviors) just kept escalating. Risperdol cause no weight gain (this boy is underweight, desperately so) but he BEGAN stimming for the first time and it has yet to stop, even 2 years after stopping the med. Lamictal - wonderful while it worked, he eventually grew out of it. This is when our sleep issues started. SSRIs - don't do squat for him. They worked for about a year (after we tried several) and then quit. We're weaning. They make him worse. Which is funny, because they made ME worse. I switched to Wellbutrin. So much happier. Clonidine - finally prescribed in a teeny dose after six years of little-to-no sleep. Best thing ever for our family! He is so much happier, is calmer and smiles more. Most doctors hesitate to prescribe this, but it is such a tiny dose. And because his behavior changed so dramatically once he started sleeping, it was worth the hard work to get it. Focalin - we hesitantly tried this because of his history with seizures, but he has been on it for six months and the results are astounding. A kid with SEVERE Adhd now sits and plays with toys. He smiles at us and makes eye contact. He is LEARNING for the first time! It's amazing. Melatonin didn't work for him at all. His brother, however, takes it successfully (also on the spectrum). People may criticize those of us who try medications, but when you try everything else (behavior therapy, specials diets, supplements, etc) and nothing works, what else is there? I'll never, ever again buy that nonsense. Meds, special programming and therapy is what this boy needs. Happy, thriving and growing. Sorry to be long-winded. You just made my day. Thank you thank you for your input. It's astounding, isn't it -- how differently our children respond? "Happy, thriving, and growing" - so glad to read it. I wish it hadn't taken so long to get there, but what a reward for persevering.